It is the policy of Big Rig Truck Driving School to offer the highest level of quality and performance in all areas of operation. GET YOUR CDL AND GET ON THE ROAD. We offer the highest level of quality and performance in all areas of operation. PURSUE A REWARDING CAREER ON THE ROAD. START WITH BIG RIG. 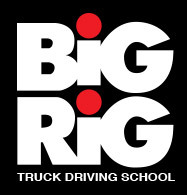 Big Rig was established in 1995 as a direct result of the truck driver shortage that has now reached crisis proportions. It is part of a family of trucking and training related companies. We have helped thousands of drivers get their CDL and begin a thriving career. Each student receives 40 hours of classroom time and at least 40 hours of actual behind-the-wheel instruction on the Big Rig practice yard and on the road. The school provides training in the job selection, application and interviewing process, but it is ultimately up to the student to successfully complete that process. Take A Look At Our Page And Follow Us For News, Updates and Events! Big Rig is always looking for part-time truck and bus driver instructors.This is a great way to earn extra money in your retirement years. We are flexible in scheduling your hours.